My Journey into the World of Scratch Adventures in homemade, budget aware cooking. I think I had 3 servings of this salad while waiting for the husband to get home from work. It is good. Try it. Marinate chicken strips in soy sauce. Cook in hot oil until browned and no longer pink. 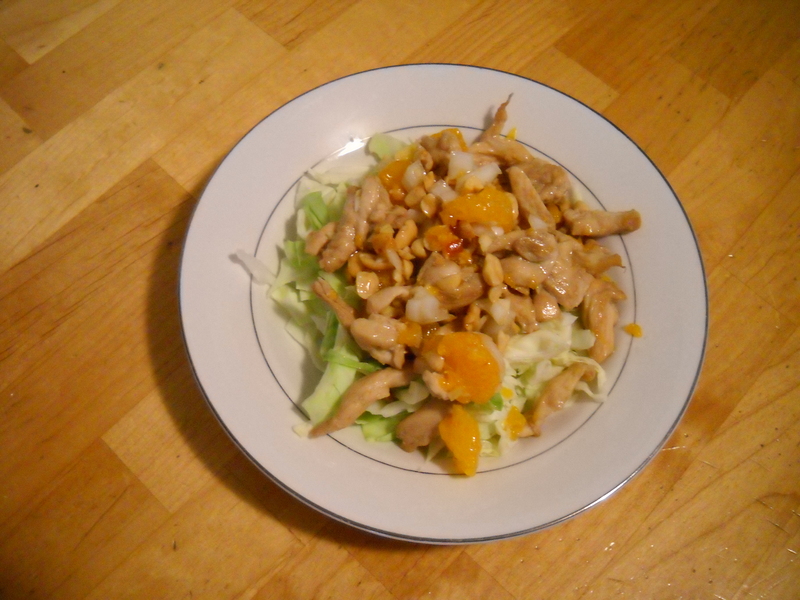 Combine chicken, orange pieces, onion, and peanuts in a large bowl. In a small bowl, whisk together the reserved juice, lemon juice, chili sauce, soy sauce, ginger, salt and pepper. Pour 2/3 cup of dressing over the chicken mixture. Combine. Serve over cabbage and top with chow mein noodles. Join me as I experiment my way through several cookbooks trying to learn how to successfully feed a family on a budget and cook new and exciting things along the way. Are you tired of throwing away egg whites when a recipe only calls for yolks? Freeze them in an ice cube tray and save them for a later day!